To finish last week’s wonderful world of work, I engaged in our state conference on education for administrators. It’s always a fabulous few days of enlightenment and connectivity. It’s the conference that I most look forward to. Not only does our state organization (North Dakota Council of Educational Leaders) put on a great conference, but the conference gives us a chance to collaborate and communicate commonalities and differences that exist in our schools. We talk about all sorts of positives and problems that exist in our local schools. We try to be proactive and solution based as we think about the critical components of educating all children. We truly do have the best interest of every student at the forefront of our minds. It’s amazing to see over 400 people sitting in a room, knowing that each of us has the desire to not only improve student learning, but to make a profound difference in the youth of our nation. North Dakota you are truly blessed to have the individuals that you do representing your children. Throughout the course of the conference we will talk about topics that include curriculum development, school safety and security, classroom management, blended learning, data analysis, formative and summative assessment, school improvement and much more. Not to discredit the solutions and action plans that come from these topics, but I often walk away thinking we missed a critical component. Whether it is enhancing school safety or increasing student achievement I feel one characteristic that certainly covers all others tends to be on everyone’s mind, but often taken for granted as a viable solution. 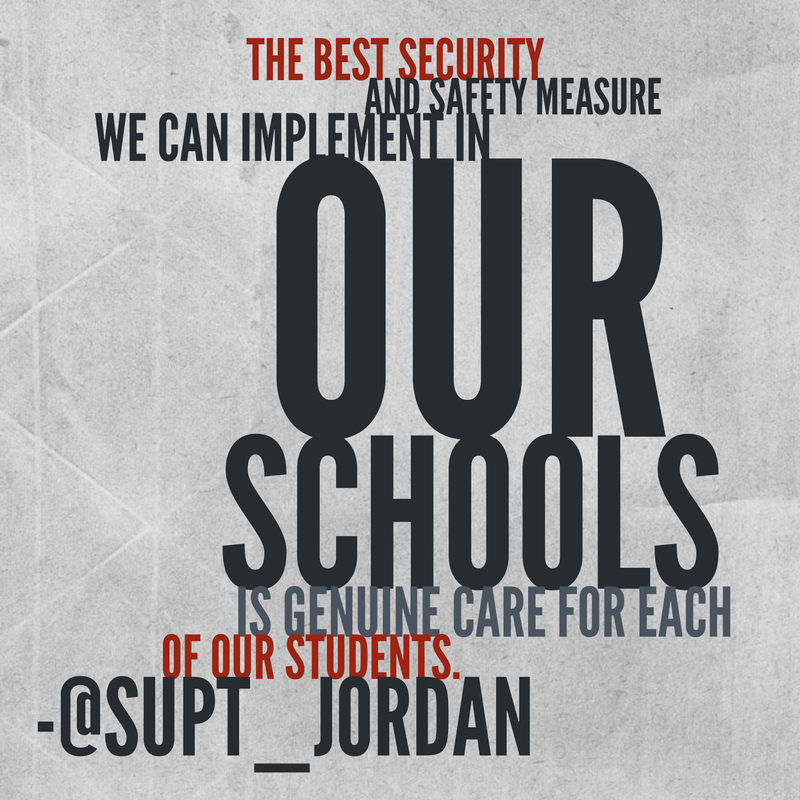 You see, I honestly believe that the best security and safety measure that a school can take is building relationships of trust and care with students. We can put in metal detectors, arm school personnel with guns, and put buzzer systems on our doors, but I feel that these are all reactionary solutions. What if we started from an entirely different angle? What if we start by building positive relationships with our students…every student? If we can show them that we care, if we can show them that they matter, if we can show them that their dreams can become reality and their nightmares a falsity then we will instill hope in them. Hope gives us all a purpose. Hope inspires. What if we inspire our students on the forefront? What if instead of being reactionary we put all of our efforts into being proactive? How would this change things? No doubt, we cannot minimize the importance of school safety. If children feel safe and secure then they will be more apt to learn. But I can’t help think a little inspiration could be a fix to the list of all the topics above. If we recognize the uniqueness of each individual and celebrate that each and every day, I can guarantee that our students will do better in school. We will see test scores rise. You will see less violence in school. Our data would indicate schools are achieving at high levels. I’ve done zero formal research, but I can tell you that I perform better when I’m being praised. I perform better when I know people care about me. I perform better when I’m allowed to be creative. Simply, I perform better when I’m inspired. I feel a sense of worth. I believe I can contribute. I daydream about possibilities and I want others to feel the same way. I do think that we take this for granted. I believe as educators we believe that we are already doing this, and therefor tend to talk about “surface solutions” (I like to call them), rather than digging deeper into the social and emotional well-being of our students. As we walk away from our conferences let’s make sure that first and foremost our job as educators is to inspire children. Let this be task number one. If we can do this effectively tasks number two, three, four, and so on will be much easier to accomplish. Thank you North Dakota educators and NDCEL for doing what you do. It is because of your encouragement, advice, and inspiration that I’m ready to enter another wonderful week of work and have many more fabulous days ahead of me.